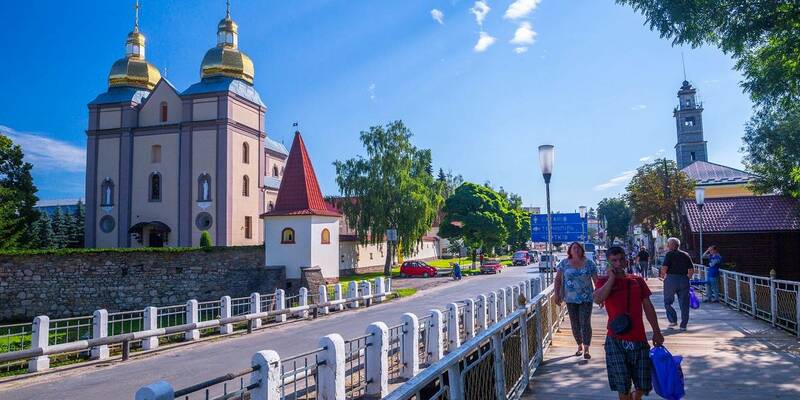 On 3 May, mayors from all cities and towns of Ukraine will visit Kamyanka to plant an alley that will not only decorate the town of poets and composers, but will also be a unique feature of the entire region. This was announced during the visit of journalists to the Kamyanska and Mykhaylivska hromadas arranged by the Cherkasy Local Government Development Centre that was established with the support of the U-LEAD with Europe Programme and MinRegion. Recently, 286 saplings of five-year-old Sakura trees will be brought to the Kamyanska AH. They will become a symbolic "Alley of friendship of the mayors of Ukraine", which will be planted by mayors of the Ukrainian cities, as well as ambassadors of Japan and Norway. According to Volodymyr Tiron, city head of Kamyanka, the alley will be equipped with benches, park signs and lighting. The Shevchenka street, along which the alley will go, shall be again asphalted, arranged by curbs and provided with illumination. Thus, in Kamyanka, besides the Tyasmynskyi Canyon, there will be another attraction for tourists and the opportunity to involve additional funds for development. Due to the support given by the Regional Development Department of the Cherkasy OSA, Cherkasy LGDC and Cherkasy Regional Development Agency, the Kamyanska hromada succeeded to get UAH 7.3 million on building up and arrangement of the Tyasmynskyi Canyon. This project won in the the regional development projects competition, which are realized at the expense of the state budget funds received from the EU. The work started last year - and today tourists can go down to the canyon and admire the beauty of the locality on the modern tile track. In general, there are provided the creation of roads and tracks to the Tyasmynskyi Canyon, the arrangement of three springs, the riverside zone, pedestrian paths, observation grounds, stairs, places for swimming and rest. This year another large-scale project will be implemented in Kamyanka. On the 50 hectares where ambrosia and self-seeding plants were growing, a Norwegian company called Scater Solar will build a solar power plant - the first project of this company in Ukraine. The power of the power plant is 25 MW, the cost of the project is EUR 30 million. Interestingly, the Norwegians compensated about UAH 880 thousand to Kamyanka for damages caused to the environment by removing shrubs grown on the site intended for construction. These funds have become a basis to implement a project of creating a unique alley of Sakura trees. The solar power plant, according to the project data, will provide the city with 30 workplaces and fulfil the local budget by UAH 1 million. This year a Programme for regulating the number of homeless animals by humane methods will be developed in the Kamyanska AH. The hromada is the first one in Ukraine to make a sterilisation-quarantine station, where street animals are treated, sterilised and vaccinated against rabies. Built at the end of last year (for co-financing of the regional environmental fund), the station has already managed to sterilise about 30 animals - and, according to the volunteer Oleksandr Novikov, it will continue its work this year. For this purpose, there will be works on the territory's improvement, the fence and summer enclosures for animals will be installed.